Hope everyone is staying healthy this holiday season. 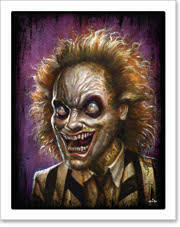 Starting now until Christmas, “El Diabolique” print prices have been dropped from $50 to $35. Happy Holidays to all! Limited edition of 25, each print is hand signed & numbered. Available for $50 each. Limited time sale price of $35.00 each from now until Christmas. Been crazy sick this week. Pen & ink wash and white acrylic on watercolor paper, varnished. This drawing is sold, but for other available artwork, please swing by the store. Moleskine Project #3 Group Art Show at Spoke Art Gallery. I’m extremely honored to be involved with an amazing group of artists for a new gallery show. Curated by fantastic artist and nice guy Rodrigo Luff, The Moleskine Project #3 at Spoke Art Gallery in San Francisco is the third show featuring work by artists in moleskine sketchbooks. Several amazing artists were each given a (or a few) moleskine sketchbooks to do their creative stuff. The books were then mounted and framed for display in the gallery show which opens tonight. Check out the amazing collection of the previous moleskine show works here. If I lived closer, I wouldn’t miss this show for anything, but alas, San Francisco is a little too far at the moment. If you’re in the neighborhood, or even a few dozen miles away, it’s worth the trip. Enjoy the show! Ink, collage, acrylic on moleskine sketchbook, varnished. Mounted and framed. Please direct all purchase inquiries to Spoke Art.